Gift cards are the second most popular holiday gift, but $1 billion-worth of them go unused each year. Giving a gift card is often seen as a cop out — but maybe that’s because so many gift cards go to waste. Gift cards are the second most popular holiday gift, with around 56% of purchasing one this time of year, according to data from the National Retail Federation, a trade organization for retailers. The only gift that’s more common is clothing and accessories, which are given by 59% of people. Around $1 billion in gift cards goes unused every year, according to advisory firm CEB TowerGroup. Unfortunately around $1 billion in gift cards goes unused every year, according to a 2016 research study from advisory firm CEB TowerGroup, despite the fact that gift cards cannot expire until five years after they’re used by law. That doesn’t mean consumers should avoid giving gift cards, but it does mean that they need to put more thought into choosing one to ensure it pays dividends to its recipient. “To do it well requires a certain level of intimacy with the gift recipient,” said Lisa Rowan, personal-finance expert at The Penny Hoarder. Here’s how to avoid gifting a loved one with a gift card that wastes away in the back of their wallet. Savings and gifting platform Goalsetter offers digital gift cards, called GoalCards, which can be deposited into FDIC-insured savings accounts, regardless of whether the recipient already has an account with the site. With that money, a consumer can set up their account to save toward a specific goal. For children, the site automatically creates a savings account and an education fund. Opening a savings account with Goalsetter is technically free, but if families choose to pay the company for their account 5% of the proceeds go to various children’s charities. Another option: Contribute to someone’s education. 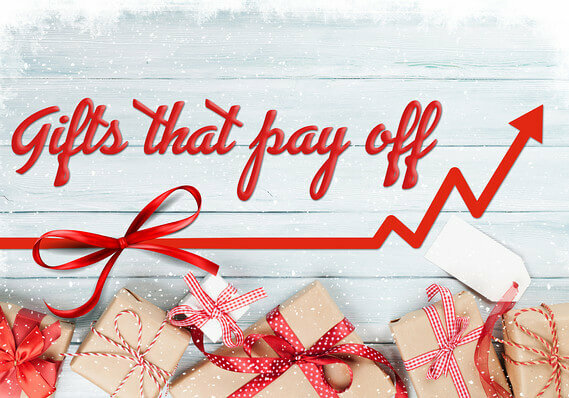 GiftofCollege.comoffers gift cards that can be deposited into a 529 college savings plan or used toward paying of student-loan debt. For students and graduates, there are gift cards for micro-investing services. Similarly, for those looking to give to a friend or family member who is fresh out of college and starting on their path toward building their financial foundations, gift card for the micro-investing service Acorns, said Trae Bodge, shopping consulant for Gift Card Granny, a gift-card resale website, which clearly has a vested interest in people buying gift cards this holiday season. You can also give a gift card to be used for buying stocks through StockPile, another investing app. And for the philanthropically-minded, gifts cards are available for DonorsChoose.org, a nonprofit that allows public schools and their teachers to raise money for classroom projects. With the gift card, the recipient can donate funds to a project of their choosing. Another way to make sure they don’t end up in the sock drawer: Figure out what stores or restaurants the recipient frequents, Bodge said. The store should be within a reasonable distance. “Don’t get an Ulta gift cardULTA, -11.72% for the teen who lives 45 miles from the nearest location and doesn’t have her driver’s license or a credit card through which to place online orders,” Rowan said. While a gift card from a bank or credit-card issuer such as Visa V, -3.16% might seem like a slam dunk since they can be used virtually anywhere, cash might be better in that case. Keep in mind that cards from companies like Visa or American Express AXP, -2.00% often come with activation fees and inactivity fees. A lost or expired gift card is worthless for the recipient. The simple solution to avoid that fate: Go digital. “A record of the digital gift card will live in their emails so when they are ready to use the gift, they can access that email,” Bodge said. If a consumer opts to go the digital route, they should look to buy an e-gift card from a retailer that will still accept them at their brick-and-mortar locations, as some companies restrict digital cards to online purchases only. Another word of caution: make sure you buy a digital gift card in the correct currency. Some airlines are strict when it comes to what currency you can use to redeem it. European airline Aer Lingus will only allow you to use euros from any country in the Eurozone, but if your trip originates in the U.K., for example, you’re out of luck, and the airline won’t change the denomination. A spokeswoman for the company told MarketWatch, “Aer Lingus vouchers can only be used to purchase tickets in the denomination of the voucher. At point of purchase, the purchaser of the voucher can select their chosen currency. There is no expiry date on Aer Lingus vouchers, therefore they get used.” They may eventually, experts say, but that’s of little consolation to a cash-strapped traveler over the holidays. Not happy with your gift card? To attract a buyer, the gift cards generally must be listed at a discount. But not all retailers are created equally when it comes to attracting higher prices for their gift cards on resale sites like Gift Card Granny, Raise or CardPool. Not all retailers are created equally when it comes to attracting higher prices for their gift cards. The least discounted categories of gift cards, as of December, on Raise were electronics/tech (3% off on average), home and garden (5%), beauty (5%), department stores (6%) and pet stores (6%). Comparatively, flower shops and restaurants saw the biggest discounts, making them generally poorer choices as gifts if you believe the giftee will try to cash out. As for the individual retailers whose cards fare the best on the resale market, those vary. Walmart gift cards had the highest resale value, according to a recent WalletHub study, followed by AAPL, -3.40% Red Lobster DRI, -3.94% and Whole Foods. Alternatively, simply swap old gift cards for ones without dog ears. “Most retailers will replace unused gift cards with shiny new versions — perfect for re-gifting season,” Jill Gonzalez, an analyst at WalletHub, said.